Mists of Pandaria (or Panda Man of Mystery) is not far away, so you might already want to prepare for the launch. Best time to make gold in world of warcraft is just when a new expansion is launched. People are after realm first achievements, shiny new equipment, enchants, flasks and all that stuff that makes it a faster trip to level to 90. This makes all professions shine! Zero farming required. make in the first 2 weeks of Mists of Pandaria? Some of the current profession gold making methods will be a lot more profitable in the coming days, at least for the first few weeks. I will be going through this list in multiple posts. Each post is dedicated to one single profession, so you can easily find the ones you have available. Keep an eye on the main page, or twitter feed for the next profession. Note that you need your profession maxed before you can make use of this. Prospecting high level ore requires 600 skill in Jewelcrafting, so stick to prospecting Ghost Iron Ore first, as it requires only 500 skill. This is perhaps the most well known gold making tip. It has always worked during new expansions, and will work even better soon. Even if a stack of Ghost Iron Ore sells for 700g, the goodies you get out of it may sell for triple that. Do check the current prices for gems and dusts before deciding to prospect. Note that profit depends on how much competition you have, and how fast you are. At this point you will have lots of excess green jewelry, and also lots of competition most likely. It's a good idea to send all of the green quality rings and amulets to an enchanter for disenchanting. New dust, essences and scrolls sell like crazy every time. As soon as you can, obtain the design for rare agility gems, Design: Delicate Primordial Ruby. Agi gems will be hot, but be aware of competition. Many people think the same way, and some focus on other gems, like Int or Str. Because of this, there will be a lot less people selling blue gems. Some blue gems, like Solid River's Heart are needed almost as much as red gems. If you have the blue stamina gem market for even some hours, you will become rich. Same goes for Rigid River's Heart gems that are invaluable for people wanting to get hit capped. 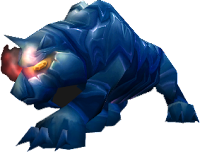 Once you have learned higher level recipes, you should also create meta gems and mounts, like Jeweled Onyx Panther.